EDISON'S INN, in the heart of downtown Stratford, Ontario, is a space designed to give you a small, deserved break from the daily grind. We want to inspire you by our ideas, design, music, snacks, beverages and friendship. When you leave, our hope is that you are refreshed and energized to take on whatever lies ahead with passion, strength and humour. 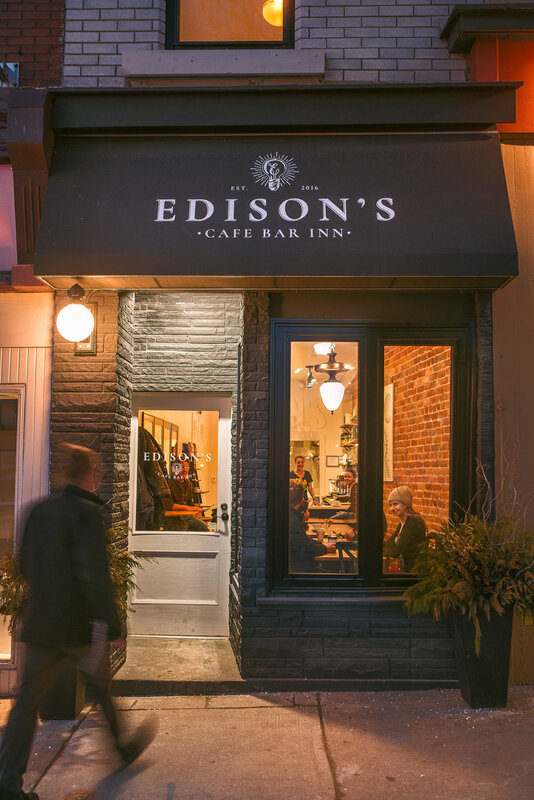 EDISON'S Cafe Bar and Inn, in the heart of downtown Stratford, Ontario, is a space designed to give you a small, deserved break from the daily grind. We want to inspire you by our ideas, design, music, snacks, beverages and friendship. When you leave, our hope is that you are refreshed and energized to take on whatever lies ahead with passion, strength and humour. Yeah, a comfy bed is important but there is so much more to a trip. Your first decision is to choose from one of the rooms at the Inn or the cottage. Maybe you want all of them to celebrate a wedding, a family reunion or just hang with friends. Next, feel free to plan out your week by checking out our road trips. When you arrive at Edison's, there will be coffee cups in your room - drop into the cafe for a coffee, tea, glass of beer or wine. Edison’s, located in the heart of Stratford, has three unique rooms each with its own personality. Room #1, referred to as the Chill-out Room, has a street view, protected by a large maple tree. Room #2, the music room, is the largest of the rooms with plenty of space to play the in-room guitar or to dance to the tunes. Room #3 is on the main floor overlooking the Avon River. It is the perfect room for coffee lovers, with direct access to the cafe. Stratford has over 45 restaurants with a wide variety of offerings from Indian to Thai to Pub to Sushi to Fine Cuisine. What better way to start your day than in the cafe located right in the Edison’s building. Buffy, the owner operator, is inspired by the simple things in life- good food, coffee, wine, music and conversation. The cafe was designed to encourage family and friends to come together and enjoy simple pleasures over breakfast, lunch or just a break. From Edison’s, it is a short walk to many other tasty restaurant choices. Over the last couple of years, the Edison cottage has celebrated some great events from weddings to reunions of old friends. Located a short distance down the river from Edison's Cafe Bar, it is the perfect place to get together with friends or just to step out of your everyday life for some self love. Unlike the downtown Inn, the cottage is located in a Stratford neighbourhood. A fully equipped kitchen, with a gas range and BBQ, provides all the necessities to entertain friends or to just enjoy a home cooked meal with your partner. There's so much to see in and around Stratford and we make it all possible because we LOVE road trips. Zipline the Elora Gorge, take a cooking class on a local farm, swim an abandoned mining quarry, forage for fiddleheads and leeks, take a painting class, enjoy Ontario’s best beaches, shop the many antique stores, tour the many craft breweries or take a meditation and yoga class in the outdoors. No road trip is the same. Each trip is hosted by someone passionate about the subject. Stratford is the coolest town in Ontario! Okay, it’s a personal thing but once you get to know it, you are sure to come to the same conclusion. When does a city of 32,000 residents have so many spectacular restaurants, music venues and stores. 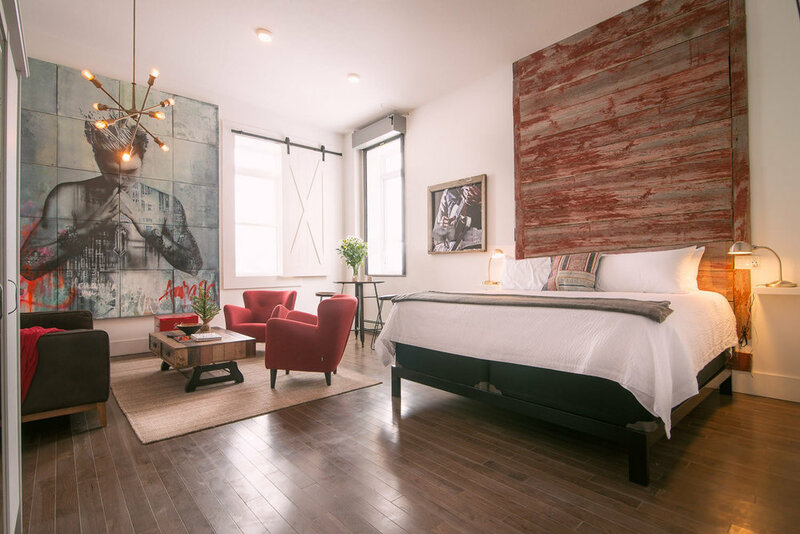 Best known internationally for North America’s largest classical repertory theatre company, Stratford, settled in 1832, has the best of big city living while only taking ten minutes to get from one end to the other and that’s on a busy day. Better yet, the beach isn’t far away. In fact, ten beautiful beaches including the Pinery, Point Roberts and Grand Bend - are within an hour’s drive through stunning farm land and quaint towns (Bayfield). Cafes are full of passionate discussion from the arts to international issues. It is a vibrant place where thought leaders come to live including Loreena McKennitt (Musician), Colm Feore (Actor), Peter Mansbridge (National News Anchor) and Brian Cooper (Business). The vibe is positively impacted by young entrepreneurs and creative professionals. Who can forget that Stratford is also the home of Justin Bieber. Those who plan only a weekend in Stratford aren’t disappointed as there is so much to do - a week is a much better choice.